It’s no secret walking is the perfect exercise. You can do it anywhere, anytime, and your risk of injury is almost nil. 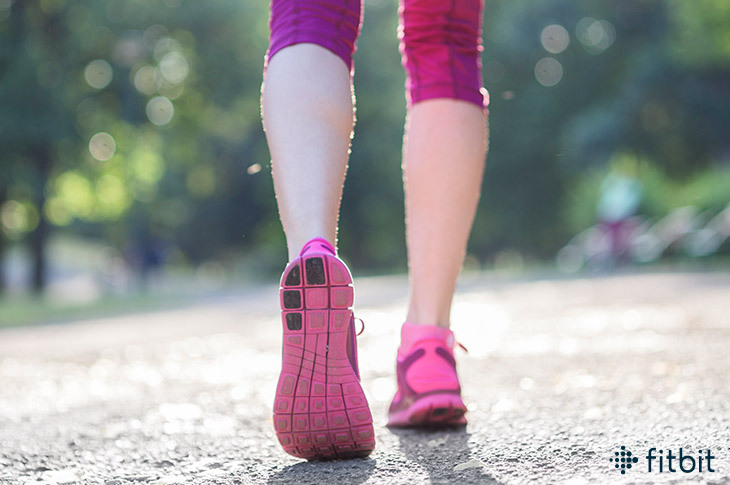 Not only does walking help control your weight, but it’s recognized by the American Heart Association as a way to lower your blood pressure, improve your cholesterol levels, and increase your energy. It’s also been shown to improve your mood. Bumping your speed to a brisk walk (from 2 mph to about 3 or 4 mph, or between 3000 to 4500 steps in 30 minutes, for the average person) will increase your heart rate, so you can burn more calories. Another way to torch calories is to vary your speed. As with any form of interval training, when you perform short, more intense bursts (30 seconds to one minute sets of exercise) and rest in between (in this case, walk more slowly for a minute) you may be able to sustain a tougher workout over a longer period of time. Adjusting the incline on your walks isn’t just for treadmills, although that’s an easy way to do it. You can go for a hike or you could even check out areas near you with hills where you can walk safely. Not only does walking on an incline burn more calories by forcing your muscles to work harder as they push and propel you uphill, but it also fights boredom. Walking is a weight-bearing exercise on its own, since you’re carrying your own bodyweight, but for an extra challenge, wear a backpack filled with some bottles of water. If you prefer more evenly-dispersed weight, you can buy a weighted vest at any sporting-goods store. For Christmas I got a waterproof wireless mp3 player. Now I just put in on, hit the button and off I go. No tangling in the headphone cords, no killing my phone battery. It has really helped me increase the intensity of my walking workouts. I plan 2 songs per 1000 steps and as I get further into the workout, the further ahead I get of that ratio. I’ve had back surgery, so I must be careful of the amount of time I wall and my pace. I also now have to have knee replacement surgery soon. What can I do to get my heart rate up? I broke my right ankle and sprained my left last year and i am really struggling when walking on uneven ground. We live in the countryside so have great walks on our doorstep but a lot of them are hilly, lots of stones in the paths. First, make sure your shoes are supportive and wear orthotics if necessary. Second, these injuries can take years to heal fully, you need to do ankle flexibility and strengthening exercises. These could include standing on a body ball or wobbly surface, doing the warrior yoga poses particularly warrior 3 building up the time that you can hold it for. Standing with your toes on a stair and gradually letting your heels drop, ankle circling, going up on tip toes up and down. Don’t overdo it and gradually your ankles will get stronger and more flexible again but be patient. Since you have already had injuries, you should avoid exercises where loss of balance could further injure you. You can increase ankle flexibility while sitting in stocking or bare feet and drawing the alphabet, caps followed by lowercase, with your big toe (found on YouTube and works for both wrists and ankles. I suggest the “standing on a stair” exercise be replaced with standing on a large book (4 inches max) with a table or heavy chair back to rest your hand on for balance. That limits the injury caused by over extension. Is there a way to save walking routes so I can choose depending on my other activities for the day? I’m going to purchase a Fitbit but that feature would be awesome. If not, do you have any suggestions of another simple app that would do that? I tried Map My Hike which gives distances that are significantly inflated. Although it looks great on my record it’s not true.